By this point in our cultural and literary history, any new book by Susan Orlean may be considered something of a treat, as well as a major event in publishing, what with the Meryl Streep-ified success of The Orchid Thief and all. This, added to the fact of what nimble, joyful treasures her past books and New Yorker articles have always proven themselves to be. And like being honored to receive an invitation to dine at the chef’s table, it is best in these circumstances not to attempt to choose the beef over the veal, the chicken over the fish, but to eat what is put before you, knowing that whatever emerges from that oven will be marvelously cooked and properly sauced before it finds its way to the table. In the same way, it has always part of the fun when it comes to Susan Orlean and her work—first the guessing game of “What will it be?” followed by the surprise of discovering what topic has caught her eye, captured her fancy this time around. And this time around, Ms. Orlean is focused, enthralled actually, by the unlikely subject of Rin Tin Tin, that German Shepard with those soulful brown eyes, those staunch shoulders, that chesty growl—all coupled with an award-winning leap that could send him sailing 12 feet into the air, cameras rolling. Add to that the fact that, if the reader can combine the various dogs who, onscreen, were Rin-Tin-Tin (“Rin-Tin-Tin” being the preferred television spelling, “Rin-tin-tin” being the spelling that owner Lee Duncan himself preferred, and “Rin Tin Tin” being the spelling that Susan Orlean settled upon, which more or less standardizes it now as the correct one), merge several performers into one character, it is perhaps the ultimate Hollywood story. One that, in a human incarnation, would have suggested the likes of Judy Garland or Mickey Rooney, with high highs, low lows, reinvention and the triumph—and failure—that it brings. The story of Rin Tin Tin begins dramatically, in the battlefields of France during World War I. A young farm boy from California named Lee Duncan went off to war with a dream of becoming a flying ace and of leaving his old life, part of which had been spent in an orphanage, behind. In a war in which dogs, as work animals, were as much a part of combat as humans, Duncan’s discovery was of great value. He managed to free the dogs and to get them back to his base, where they were given over the various combat tasks, with Duncan withholding only two, a female that he named Nanette and the male he named Rin Tin Tin. This story survived, of course, in part because of the legend behind the animal. The dog stayed by Duncan’s side throughout the war (dogs were used for many varied purposes then, from “Mercy” dogs who walked out onto the battlefields with packs of medical supplies to be used by any wounded soldiers who were able, to cigarette dogs, terriers who carried packs of cigarettes through the trenches in order to help the soldiers combat stress) and was allowed to return to California with him at war’s end. —struggles to make the transition from silent pictures to talkies in the same manner as John Gilbert (as one studio memo put it, “the making of animal pictures, such as we have in the past with Rin Tin Tin, is not in keeping with the policy that has been adopted by us for talking pictures, very obviously, of course, because dogs can’t talk.”), only to battle his way back and become one of the world’s best known film stars. —suddenly dies in the summer of 1932, only to be replaced by the woefully inferior Junior, the male pick of his litters, who, with his boxy head and pleasant manner would only manage to turn out a couple of movies to this father’s dozens. From here, the legend of Rin Tin Tin conspires with us to allow us to be less caught up with the facts than with the image of that glorious dog, standing on a bolder at the back of the screen, watching over us. And that animal movies so fell out of favor that, despite the fact that Rin Tin Tin was the most famous movie star on Earth, polling in at 94% name recognition—something that no human actor could approach—Rin Tin Tin went for so long without working that Duncan and his family ultimately had to live off his wife’s salary as a secretary until something happened. That “something” involved a Hollywood shark of the old school named Bert Leonard and the burgeoning medium called television. And from here the number of hands who reach out and grab hold of the legend of Rin Tin Tin become as many and varied (some connected by bloodline, others not) as the dogs who may or may not have played him. 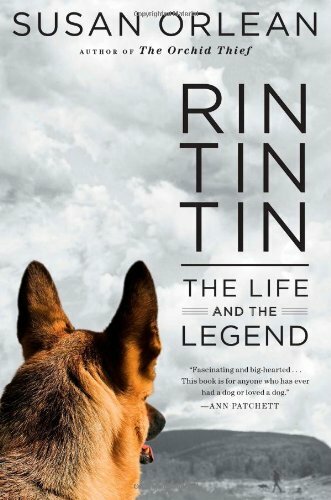 Throughout Rin Tin Tin: The Life of the Legend Susan Orlean presents a story that is as engrossing as it is illuminating, which is, of course, her special magic. This is one hell of a book, one that the reader rushes into headlong, haunted by the eyes of the beast whose picture adorns the first page of a chapter entitled “The Silver Screen,” only to slam on the breaks hard, when it becomes apparent that this wonderful read will end all too soon. From first to last, the story is Rinty’s (as he was called on movie sets) own, with that doggiest of dogs alive on every page, as Susan Orlean herself joins the strange comrades, many of whom have been in and out of court for years, fighting over the rights to an animal who has been dead for nearly 80 years, who have dedicated years of their lives to insure that the legend lives on.